What's next? The lure of 100 mile races. What's next? It's a tough question when you have run a bunch of half and whole marathons and 24 ultra marathons, including eight 50 milers and four 100 milers. What's next? The Grand Canyon? Check. (one of the top three most amazing experiences of my life, by the way) Running a 200 miler? .... Nah. At least for right now, that is not on my bucket list. 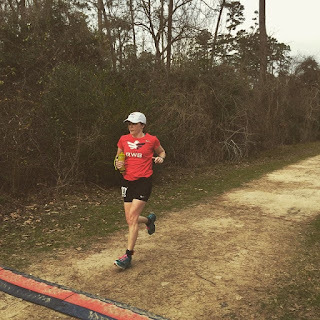 Running a harder 100 miler? BINGO! After my last 100 - Rocky Raccoon in 2015 - I thought I was done with that distance. I didn't make a firm declaration - I know better, but I thought getting the 500 mile jacket at Rocky would be the end of that era. Not so much. There is something about the 100 mile distance that draws you back. Besides the thousands of miles run in training, hundreds of squats and push ups, hours holding the plank position....it's the journey on race day that can not be ignored. The great unknown. To me and people like me, it is downright irresistible. The starting line of a 100 miler is unlike any other start line I have experienced. At least for me, the nervous energy and doubts that fill my mind at shorter distances do not exist there. In their place is a calm, peaceful feeling. There is an understanding that what you are about to attempt defies rational thought. Some people might think you are cool or superhuman for attempting a 100 miler, but most just think you are crazy or self-destructive. At the starting line, you understand that both schools of thought hold a grain of truth. Many romanticize the idea of running 100 miles and getting a belt buckle. The reality is far from that ideal. The question is not if but when it will start to hurt. The test is how well you can manage that pain and continue to push towards the finish line. The lesson is who you are when you are laid bare and all of your truth is exposed for the world to see. There is nothing like the feeling of seeing the finish line for a 100 miler. All of the doubts, all of the pain, all of the weakness...it all disappears in that one moment. 2016 has been a nice break. Fairly lazy except for covering 31 miles in the Grand Canyon, and now I am rested and refocused. Looking forward to signing up for the AT100 miler as soon as registration opens, and spending all of the summer of 2017 running hills at Clark Creek and loops of Chicot. Top notch pacers are secured, and race crew is in place. Now it is up to me to make it to the finish line so that I can wear that sweet belt buckle to my 47th birthday party.